When YouTube changed its Partnership Program eligibility requirements in January 2018, and I received the dreaded email confirming that I'd been kicked out of their program, I figured that I would no longer make money on YouTube, or more accurately, through Google Adsense. 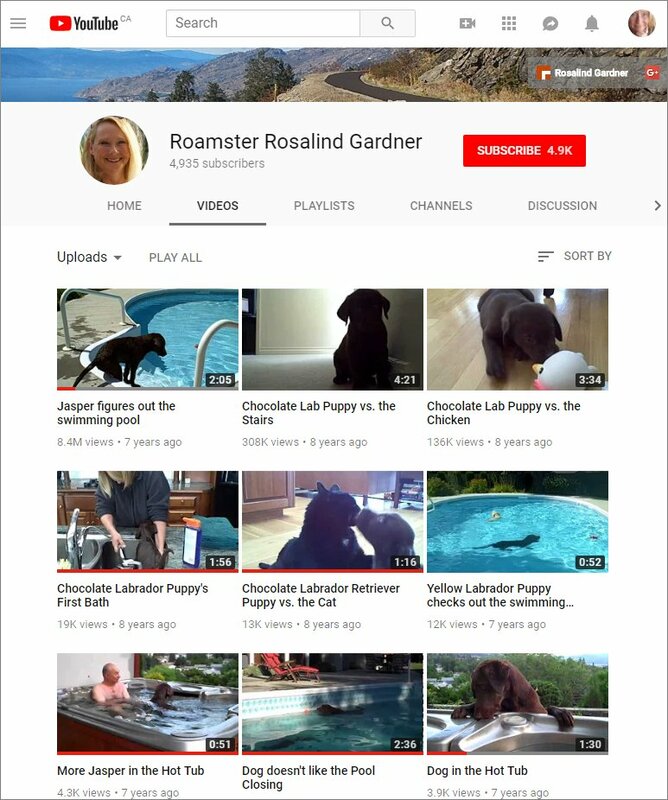 The Rosalind Gardner YouTube channel is my business channel. It didn't occur to me to check and see what my personal YouTube channel, RoamsterRos was doing… until just recently. 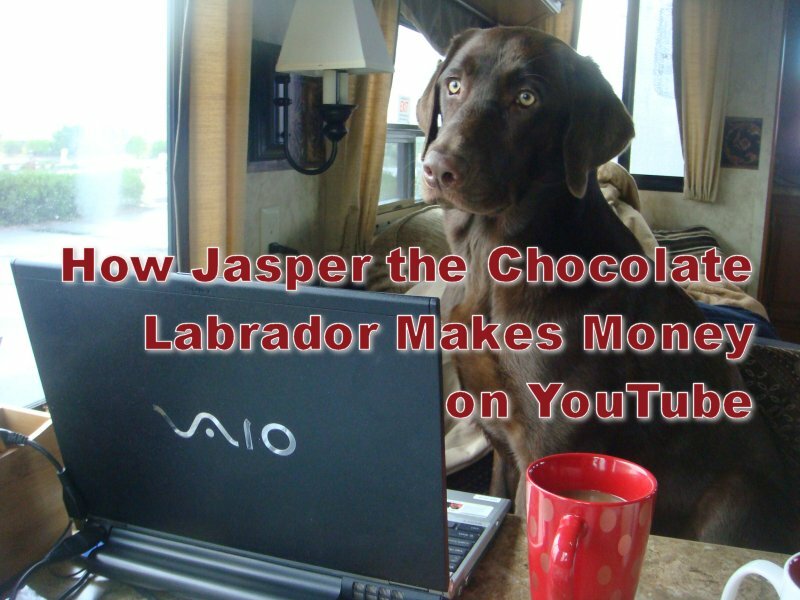 It turns out that my dog, Jasper the Chocolate Labrador, knew how to make money on YouTube all along. 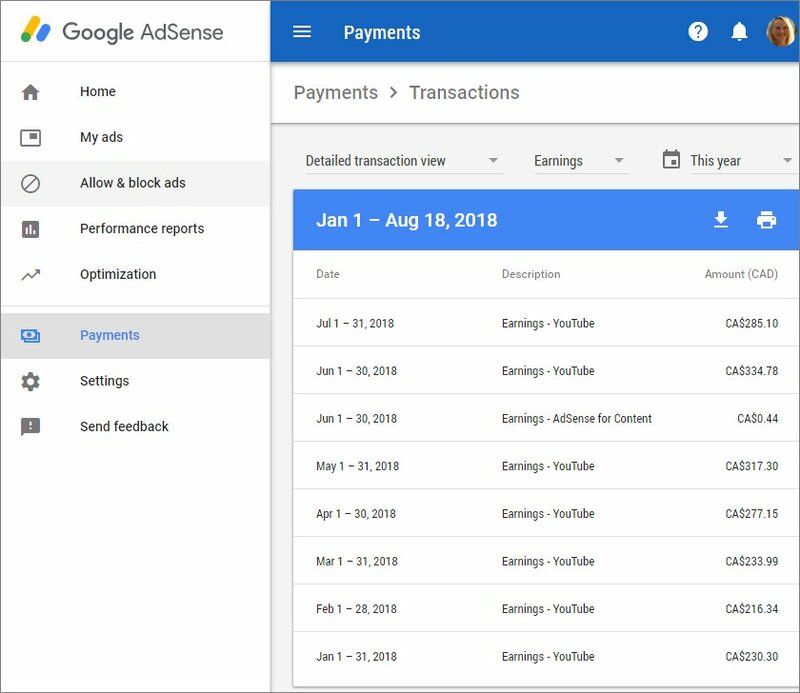 And if you are wondering why I didn't know that, it's because my Google Adsense checks go straight into my bank account and I very rarely check those earnings stats. So, when I visited my personal YouTube channel last week after uploading a video, I was absolutely shocked to see that one of Jasper's videos had 7.7 million views. 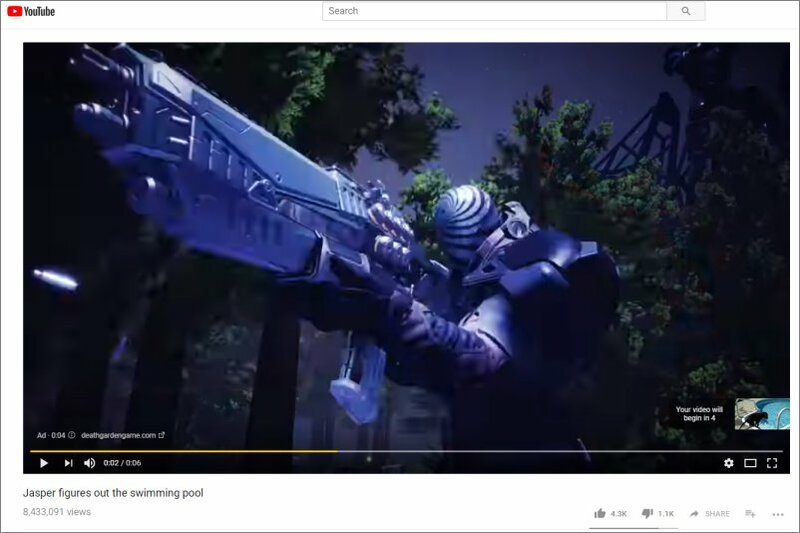 More importantly, that video was still being monetized with Google Adsense ads. As you can see from the graphic below, the number of views has increased to 8.4 million views this week. After seeing those numbers, I just had to check out my YouTube earnings figures too! The screen capture below shows monthly earnings of between $230.30 and $334.78 for my YouTube videos. MOST of that money came from just one video – Jasper figures out the swimming pool video. That buys a LOT of dog food. By the way, I absolutely HATE the sound of my voice in that video. Like yuck, why was I talking baby talk to the dog? The next graphic shows that YouTube channel with 4,000+ subscribers and the videos listed in order of their popularity. OK, so that's all nice and good, but to be honest, the fact that Jasper's video is a ‘hit' was an absolute fluke. The Playlist on which that video resides is named ‘Pets'. Perhaps renaming it ‘Chocolate Labrador' or ‘Jasper the Chocolate Labrador' would bring in even more traffic? Should I ask people to subscribe to my Channel or to leave a comment? Too, would a longer description or replying to comments be beneficial? I honestly don't know, but I'm going to try out a few things with other videos to see if I can boost traffic and earnings by using smart(er) marketing tacts on YouTube. 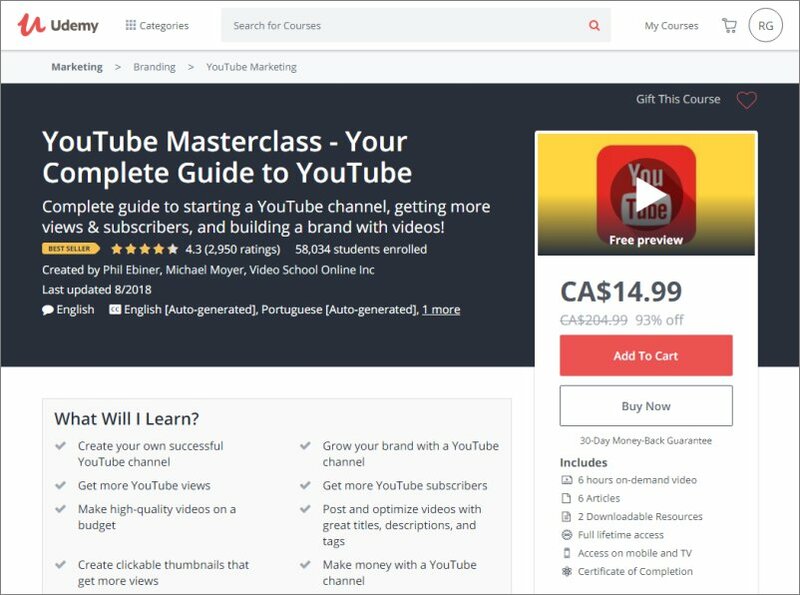 And because I really don't know much about marketing videos on YouTube, I'm going sign up for the YouTube Masterclass – Your Complete Guide to YouTube on Udemy. It has a 4.3-star rating our of 2,950 ratings and has had 58,034 students enrolled. Better yet, it seems that they update the course on a regular basis, the latest being this month. The course is currently priced at less than $15 (Canadian – it'll be even cheaper in U.S. dollars – which is an incredibly good deal for 6 hours of video instruction. Oh and if you want to make money on YouTube – buy a cute puppy and start taking videos! Making a lot of money on YouTube is not as easy as you might think. There are a lot of hurdles to overcome in the process. It s definitely not a way to get rich quick. However, if you have a hobby, are really good at a particular activity and would like to help people, are funny, or even if you just want to have some fun, YouTube is a great option to cash in some extra bucks doing something you love. Ros, I’ll bet the above sentence seems familiar, yet…odd. I’ve been learning from you for 13-15 years. You were one of – if not the first – person I trusted when I started learning about internet marketing. Thanks for the above info about Youtube and the Udemy course. Every time I think I’ve got a handle on what G & Youtube are doing…they change the landscape. Thanks for sharing & teaching. P.S. That’s the last transmission to a pilot on short final to an aircraft carrier. From that point on he’s communicating with the LSO (Landing Signal Officer) down to the deck. Like you, I was an air traffic controller. I hear you about G & YouTube always changing the landscape – and not always for the better, at least not for those of us in IM who prefer to stay perfectly on the glide path. BTW, landing on an a/c carrier is one thing I had to take off my bucket list. Bummer. Cute puppy. Beautiful dog. Thanks for sharing.